Coldplay will celebrate their record-breaking A Head Full Of Dreams Tour with the release of Live In Buenos Aires / Live In São Paulo / A Head Full Of Dreams (Film). 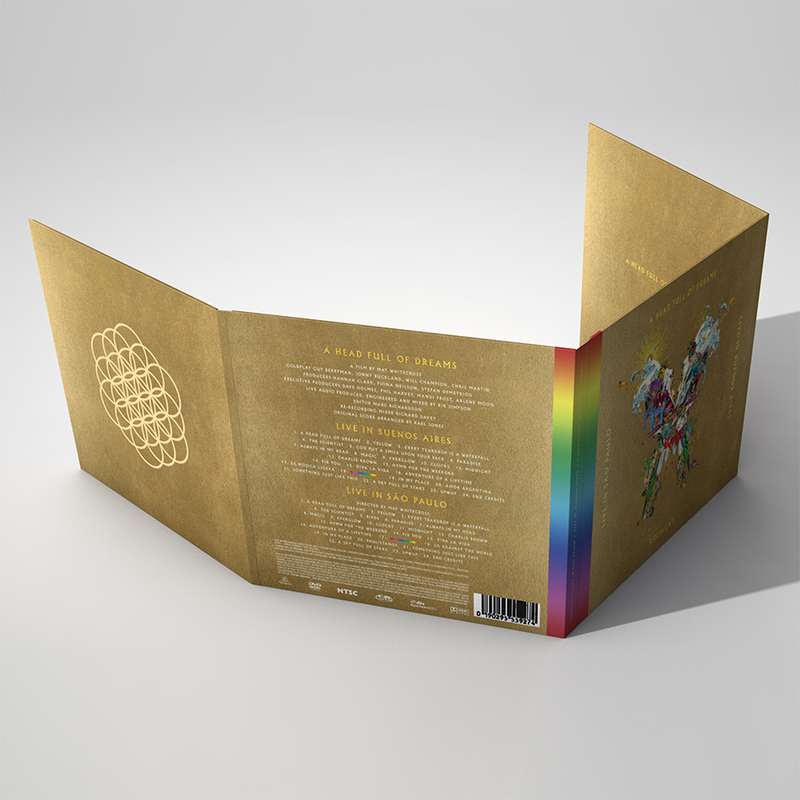 The combined live album (2 x CD) / live concert film release (1 x DVD) - also known as the Butterfly package - is completed by the new A Head Full Of Dreams documentary film (1 x DVD), which charts Coldplay’s colourful 20 year history. Live In Buenos Aires and Live In São Paulo feature hits and fan favourites from all seven of the band’s number 1 studio albums. Pre-order, release date 7 December. Carolina*, M Marks The Spot and coldplaybrasil like this. I am so happy that South America was picked as the place for all of this. I've never been to a concert there but they have the best crowds judging from video. M Marks The Spot, JM-42 and coldplaybrasil like this. M Marks The Spot, Libor and coldplaybrasil like this. thesuperlloyd, Rafael Aguiar, Westhamm and 3 others like this. GUYS!!! WHAT IS THIS??? WE WAITED SO LONG BUT NOW ITS FINALLY COMING!!! IM CRYING! M Marks The Spot and Libor like this. Hyped beyond belief that we’re getting not one but TWO full concerts. Does anyone know the track list for the DVD? WTF? Why is the live show only being made available on crappy DVD? Is there not going to be a bluray release? why on earth would they launch this and only indicate a DVD version in today's age of technology? Even the images of the packaging shows it is DVD format and not bluray. What are they thinking??? This is absurd. I mean unless they are completely out of their minds I fully expect a BD version to be released and if so, why not just roll that out with the official announcement now? Either way this is really stupid. thesuperlloyd, Westhamm, coldplayfan24 and 2 others like this. WOW! Looks like this is what Pilar Zeta was refering to when she said she was still working with Coldplay. I love the nods to all their previous works! Guys look closely. Every album is on this!! Gideon_Mx, EC-JTR, M Marks The Spot and 5 others like this. EC-JTR and Nikolette like this. man I'm at work and can't stop smiling. what a gorgeous album cover! kind of a bummer that is only available on dvd but two live concerts is unprecedent, even if both are around 90% the same setlist. should be a good christmas present for myself! M Marks The Spot and coldplaykb like this. I'm very pleased about this package. It is very promising if you think that two weeks ago we weren't sure if a Live CD/DVD /Film would ever exist! M Marks The Spot, coldplaybrasil, Libor and 1 other person like this. M Marks The Spot, coldplayfan24, coldplaykb and 1 other person like this. Guys The Scientist live version on cd!! Never thought I'd see the day. M Marks The Spot, Witfang, Krizer and 2 others like this. if you zoom into this: https://cdn.ontourmedia.io/fanfire/images/product/zoom/COL/COL84279-3.jpg you can see is not. seems like the song has been scrapped completely since it was never properly released. M Marks The Spot likes this. Can't find the reference to VLVAAHF in the artwork. Anyone?